"A winner in every department! Songs are engaging and memorable compositions, empathy songs - the best songs of all. Highly recommended, this gal is no novice and this album is a beauty! Musically, it is mature and classy coming through with ardor, fortitude and polish. A pop music legend among her peers Helen is a highly motivated mover, a superior song-stylist in the Ella Fitzgerald, Sarah Vaughan and Jo Stafford league which is praise indeed! This is a superior devotional P&W project recorded with class and distinction with the creative Jonathan Gooch at the production helm. With the help of solid musicianship, this is a gem of an album that features new and old repertoire set in the contemporary orchestrated worship-context. Many easy-listening sounds meet in a multi-genre fusion. Here we have, arguably, one of the finest voices ever to grace the British pop industry. After a lengthy hiatus the smoky voiced songstress returns with a new set again demonstrating her Messianic Christian faith. Here the veteran again demonstrates her effortless style and virtuosity in such titles as "Bless The Lord Oh My Soul", "What Manner Of Man Is This", "Rivers Of Babylon", "He Giveth More Grace". Want a few facts? 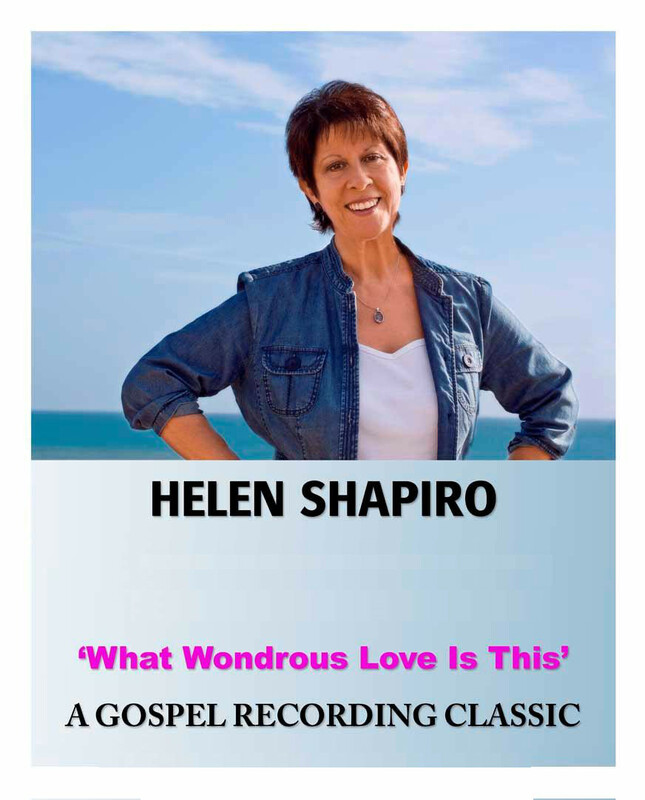 Helen Shapiro had sold millions of albums around the world by the age of 16, in more recent decades had 17 years as lead jazz vocalist with the legendary band leader Humphrey Lyttleton, and back in the early '60s, The Beatles first national tour was as her support act. Now, while longevity is not always a virtue in the music world, "What Wondrous Love Is This" is an example of someone who just gets better and better. It's Shapiro's first Christian album in 12 years and is a master-piece; assured, celebratory, constantly surprising. What else? Oh yes, at times poignant, at times theatrical - mostly, a brassy, bluesy jazz-tinged and deeply felt testament to her Jewish roots, full of Biblically-based lyrics and inspired arrangements to bless the soul. I am truly grateful Miss Shapiro's remarkable career is still bearing fruit. scriptural and uplifting tracks of worship, praise and exhortation. 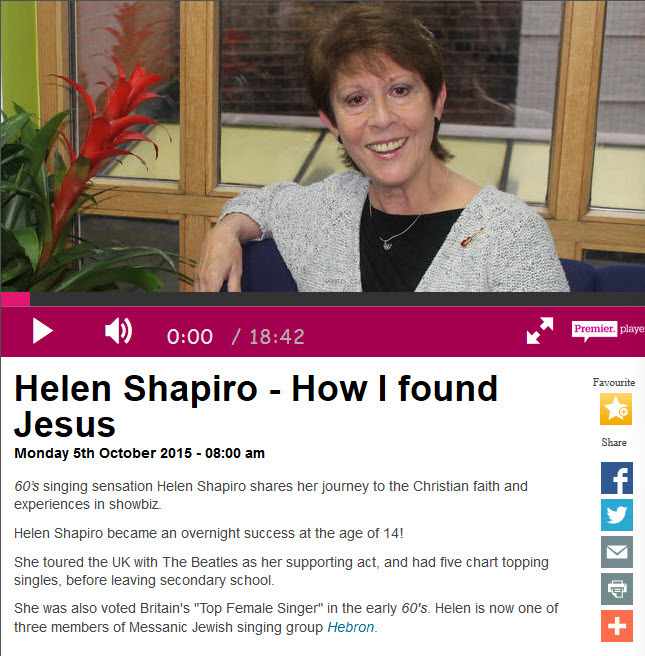 Helen's first Gospel album in 12 years. Extra Special Offer: Buy 1 'Gospel Collection' and 1 'What Wondrous Love Is This' for £20.00 plus p&p. FOR SUCH A TIME AS THIS. 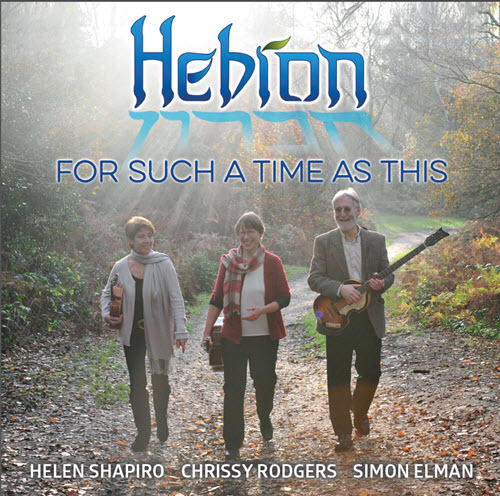 A new CD with a refreshing new sound from HEBRON! 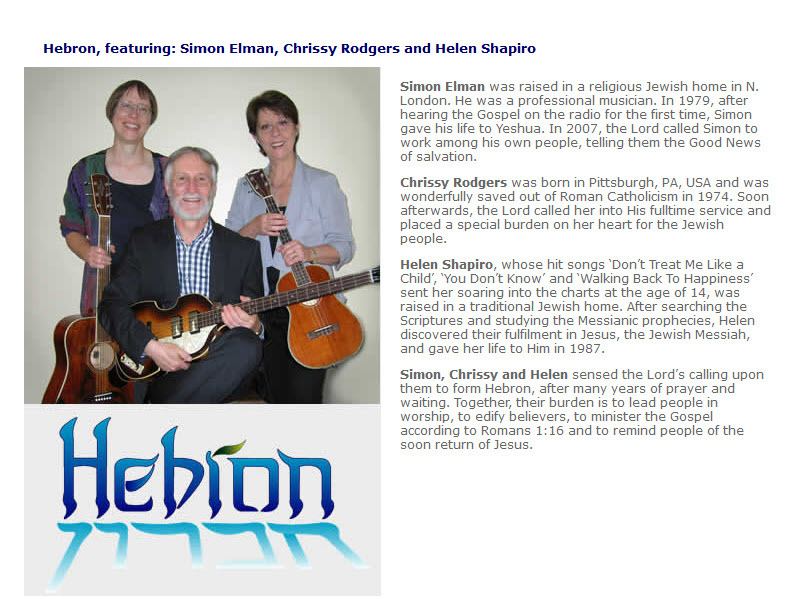 Messianic songs in a variety of styles, including Folk, Jazz, Blues, Bluegrass and Hebraic. Hebron endeavours to declare a simple and clear Gospel message so needed today. 6. Psalm 147 7. Little Bit Of Heaven 8. Come, Let Us Return 9. Hinei Ma Tov. Television, it is available on YouTube..
on Monday 5th October 2015. Thurs April 25	Carlisle HEBRON CONCERT	Castle Sowerby Chapel, Sebergham, Carlisle, CA5 7DY Free admission, by ticket only. A freewill offering will be taken. Sat April 27	Cumbernauld – HEBRON CONCERT	Freedom City Church Centre, 6 St. Mungo’s Rd.,Cumbernauld, G67 1QR	Free admission, by ticket only. A freewill offering will be taken. 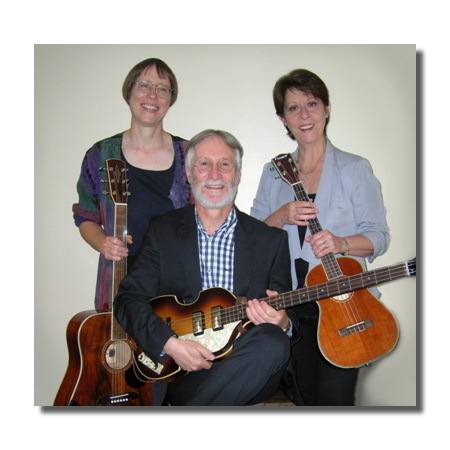 Mon April 29	Kelso – HEBRON CONCERT	Kelso Rugby Club, Poynder Place, Kelso, TD5 7EH. or Free admission, by ticket only. Free admission, by ticket only. A freewill offering will be taken. Sat June 29	Loxwood, W. Sussex HEBRON CONCERT	The Chapel, Spy Lane, RH14 0SS Free admission, by ticket only. A freewill offering will be taken. Sat Sept 14	Reading, Berks. HEBRON CONCERT Three Mile Cross Church, Mitford Close, Reading RG7 1HF Free admission, by ticket only. A freewill offering will be taken. Please continue to check the Manna Music website for up-to-date information, as there are many invitations yet to be firmed up. The list is always changing! Attendance to all of Helen's Outreaches is by ticket only. Please do not contact Manna Music for tickets. Visit the Manna Music Website.